How to Change Office 365 Group Email Address? If you want to change the Email address of a Office 365 group, its not possible through Office 365 admin center! 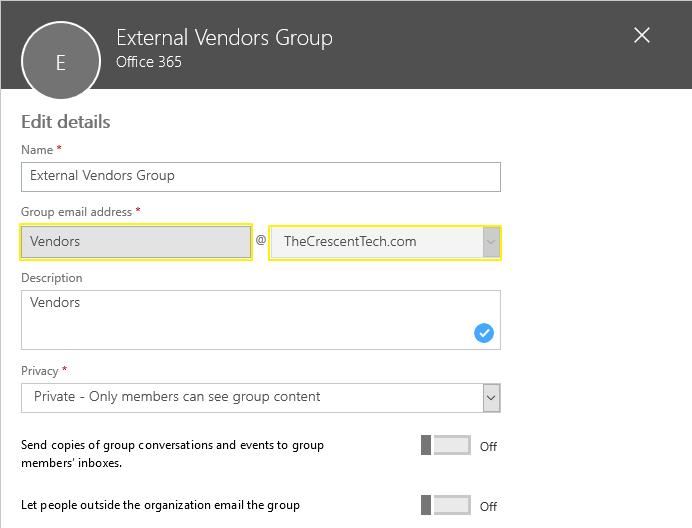 Lets change the Email of an Office 365 group: External Vendors Group to "ExternalVendors@TheCrescentTech.com"
Set-UnifiedGroup -Identity "External Vendors Group" -PrimarySmtpAddress "ExternalVendors@TheCrescentTech.com"